White House indicates President Obama will support a law that will place a ban on civilians owning assault weapons. President Barack Obama on Tuesday threw his weight behind a bill to reintroduce a ban on civilians owning assault weapons, in the wake of last Friday's gun massacre at the Sandy Hook Elementary School in Newtown, Connecticut. AFP quoted White House spokesman Jay Carney as having said the president would support a law proposed by Democratic Senator Dianne Feinstein to prohibit the arms, defined as certain types of semi-automatic firearm with removable magazines. "He is actively supportive of, for example, Senator Feinstein's stated intent to revive a piece of legislation that would reinstate the assault weapons ban," Carney said, when asked what Obama would do about gun control. Carney said Obama would also support any move to ban high-capacity clips -- magazines that hold dozens of rounds -- and close the so-called "gun show loophole" that allows unlicensed individuals to sell guns privately. Feinstein vowed on Monday to bring the bill forward, telling CNN, "It's going to be strong, and it's going to be definitive. And it's going to ban by name at least 100 military-style semi-automatic assault weapons." A previous ten-year ban on military-style assault weapons was allowed to expire in 2004, and many U.S. citizens have since rushed to arm themselves with semi-automatic versions of rifles like the Kalashnikov or the AR-15. On Friday, 20-year-old Adam Lanza used a Bushmaster AR-15 assault rifle in the attack on the Connecticut elementary school, killing six staff and 20 children aged six or seven in a hail of high-velocity .223 rounds. The slaughter has revived calls for stricter controls on arms in civilian hands, but Obama and Feinstein may encounter tough opposition from America's legions of shooting enthusiasts and a well-funded pro-gun lobby. Obama has long supported a return of the assault weapons ban, but did nothing in his first term to put his own political muscle behind attempts to revive it. 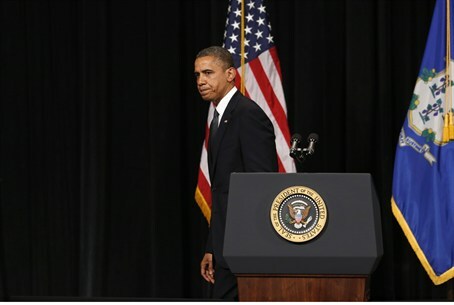 Speaking at a memorial for the 20 victims on Sunday, Obama said, "We can't tolerate this anymore. The tragedies must end. And to end them we must change. "In the coming weeks I will use whatever powers this office holds, in an effort aimed at preventing more tragedies like this," Obama added. "No single law or set of laws can eliminate evil from the world, but that can't be an excuse for inaction."